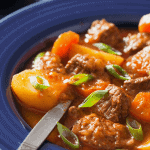 This hearty classic beef stew is at the top of my list, this traditional beef stew features plenty of delicious, garden-fresh herbs and vegetables, so it is a great way to enjoy those precious treasures from your garden or the local farmers’ market. This satisfying dish can be served on its own or paired with your favorite salad for a more well-rounded meal. Either way, this recipe will feed a crowd – or leave plenty of leftovers for lunch the next day. Continue simmering, uncovered, for another 20-25 minutes or until potatoes and carrots are tender, but not mushy. Remove from heat and discard bay leaf. Season with additional salt and pepper, to taste. Spoon hot stew into individual serving bowls and serve immediately. Big Fan of Kendall – Jackson Wines. You bet I use them all for Cooking.